Hey there. Firstoff thanks for playing and joining the conversation. If you've got any smaller bits and pieces of feedback please drop them here. If you've got larger issues worthy of discussion feel free to open your own thread though. You can also find me on Discord or you can put bugs into the bugtracker. Chase down an enemy? Let the enemy flee? At the moment, letting an enemy flee is by far the best option. It is never worth it to chase down an enemy and kill them. When you let an enemy flee you get a chance to recruit them. This fact alone makes "let the enemy flee" always the better choice. Also, you still get loot when you let them flee. You seem to get the same amount of loot by letting them flee, than when you "chase them down". The menu to "Let them flee" or "chase them down" is inconsistent. Most all of the time "Let them flee" is the first option, but sometimes, rarely, it is the second option. This makes it so I can hit the wrong options if i play fast. The first time I played this game, I got my Altruist level up into the 30s. I get a choice to attack some Rusters, or sneak past.... Attaaaack, what if they have food, I bet they could have food!! I see a Mineral Springs in the distance (Hint: Has an opportunity to heal). I don't want healing! Healing costs food! I want fooood! I run around like a ravenous animal. I get super excited when a beast enemy drops 50 food. Foooood. I mean, I guess it is sorta realistic. When you are a Prophet, with many followers, trekking through the desert, sometimes (all the time) you have to steal food from poor people, to keep your crazy group alive. Please change the coloring on the recycle button to reflect whether you already used it. It is always gray, though it does change to a nice blue when you drag your card on it. Maybe green for unused, and gray for used. It actually changes color - but may not be too much. The color of the arrow is white when available and grey when used. But you're right - changing the entire circle color is a lot more noticeable and it's an easy change. Some of the Beast cards, at least, aren't balanced the same way the player cards are. For example, the Ghram Rager costs 1 Momentum for a 1,1 and it has Charge, a powerful ability that is the equivalent of a free turn. To get a refresh, the player needs to spend a card that, from what I've seen costs momentum and penalizes the target card. There are cards that cost less than their attack and health values in the player deck, such as they might be 4 momentum for a 4,5 or a 5,4 but they usually don't have any abilities. Enforcer seems well balanced at 5 for a 6,6 with an ability that troublesome, AND it can't get onto the table for a couple turns even if the player takes advantage of obstacle benefits. I did read a tool tip or something that suggested I could discard to improve my momentum but I haven't seen a way to do it. Ghram Rager would be more balanced if it cost 3 momentum, so that if it is played on the first turn, it's the only play aside from the 0 cost cards. I do understand that the advantage of the Beast suit is low cost, rapid deployment cards the player must keep in check or risk getting overrun by. On another note, I think the obstacles could be enhanced by providing a form of cover for cards behind them. The game is considering them as under the player's control, if I have a creature behind one it cannot attack it because "only the creature farthest in front may attack." Similar to taunt, obstacles could protect characters behind them from creature and commander attacks, aside from fliers or special commander attacks. Not sure if that's within the scope of your design, but since the character behind the obstacle cannot attack it, it would be nice for it to provide an advantage. This is already in the game. It just happens that you have always been playing melee followers. There are followers with the Sniper ability. Those followers can shoot from behind rocks and behind other followers. There are also flying units, (flying ability) that ignore obstacles. Some of the Beast cards, at least, aren't balanced the same way the player cards are. For example, the Ghram Rager costs 1 Momentum for a 1,1 and it has Charge, a powerful ability that is the equivalent of a free turn. To get a refresh, the player needs to spend a card that, from what I've seen costs momentum and penalizes the target card. You think Beast cards are overpowered? I find them quite comparable to the other cards. I recruited some Ghram Ragers, I didn't even put them in my deck, I had better things. It is a 1/1, so you are wasting a whole card, to put a 1/1 on the board. The only thing it trades well against, is if an enemy drops a 3/1 or 4/1 follower. I think its quite easy to keep board control in fights against Beast enemies. Enforcer seems well balanced at 5 for a 6,6 with an ability that troublesome, AND it can't get onto the table for a couple turns even if the player takes advantage of obstacle benefits. Enforcer is one of the most Overpowered cards in the game. The ability it has (damaging stuff around it) is actually a huge bonus. Being able to clear obstacles with it, and thus open up new lanes for followers to use, saves you from attacking your own obstacles. A 6/6 for 5 momentum is already ridiculous... and then it has a very good ability. I include Enforcers in every deck I've made. I once had 6 of them in my deck at one time. Obstacles don't protect characters from things, and ranged characters other than snipers can't fire around them. Melee characters on the other team can hit the character behind the obstacle just fine. My point about Ghram Rager is how fast it comes into play. Its a 1,1 that costs the same as Quick Shot, does the same damage, but can also be improved. I've been wiped by beast deck when it gets the right combo out in the second or third turn and starts playing 0 and 1 cost cards that get to attack immediately, receive bonuses for being beasts or other buffs, and manage to keep me from keeping anything on the board long enough to attack. 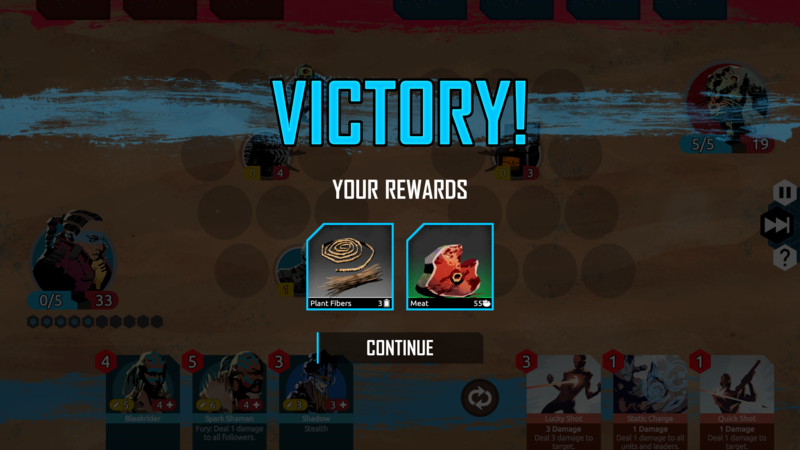 I've gotten a little mileage out of the Enforcer, I think its particularly interesting how different your strategy and impression of the value of different cards is than mine. I thin my deck out before leaving the starting camp, usually to 15 or 12 cards, holding back almost all the 5 cost and most of the 4 cost cards. I keep usually one 4 Momentum card and one Warrior Monk, a 5, but I focus my deck on 2s and 3s. Depending on draws, I usually keep it cheap and fast. For equipment and skills I look for Armor and low cost abilities, I avoid the machine gun and the beam laser and they usually don't pay off for me. In play I discard anything I can't bring out at the first or second turn, I usually prefer to see a wild hand or a sapper. My best play is with lots of low cost cards reinforced with cards that improve all of them, and protected with a Taunt. I prefer to whittle down the enemy before the momentum is high enough for them to bring out anything I can't handle. That's the strat I've developed so far. I've been dealing with each of the factions I've met fairly consistently. I think it speaks to the game design very strongly that multiple strategies are valid, and that for them the various cards have different merit. For my strategy, the Enforcer is so expensive that I likely won't be able to play it, and it would do too much damage to the cards I'm using at the time. But they do, enemy followers have to hit the obstacle first to get to your follower. I have hidden a sniper behind an obstacle. It was the Explorer (the one with the dev's face on it), one of the only two I have been able to recruit. Unless they are using a leader skill card to target your follower. Is that what you mean? Leader skill cards can always target all things, whether cloaked, or hiding behind things. and ranged characters other than snipers can't fire around them. There are no other "ranged" characters besides followers with "sniper". (only ones with flying, and those can also shoot over them) So I don't know that you mean. Melee characters on the other team can hit the character behind the obstacle just fine. I don't mean to pick on you for this obstacle/cover thing, but I just can't figure out why you don't think it works, or what you mean by those statements. Since they can regenerate on your turn and on the opponent's turn, they are nearly invincible. and once you buff them, they destroy everything. Have been taking notes during my playthroughs, so here's what I have so far. Mostly going into the things I noticed that I feel are weird/buggy/typos. I loooooove the game, that's why I focus on the things I think can use some work to make it even better. Special props btw to the new paths you can discover while you travel. Really like that added touch. - It took me a while to figure out that items you buy that raise Hope need to be shared through the Inventory system. Seems extremely convoluted. Why not have it shared when you buy it, or loot it, like Food and Batteries? - Shouldn't you be able to attack Obstacles with Leader cards? - Guess improved AI is on the docket but it can act pretty strange atm. Not using its attack when it has the Charge ability. Sometimes not attacking with (all) units when it's their turn. Making stupid decisions, like attacking and then afterwards playing +1/+1 on that same card. - In the event where the first sentence is 'The sun had barely risen above the horizon...' where you can recruit a man and two children it shows two times 'Invite them', but for one option you need 11 Altruism. The regular 'Invite them' also recruits them, so no use for extra option. - Seen several typos in my playthroughs, don't know if you want me to keep track of them or if you get to going through all the text at a later time anyway? - Do you not get to see the value of a weapon before you sell it? Don't really get why there's a dismantle option in your Inventory menu when you can also sell them. - There's a case of text covering up other text with the Poison Dagger. 'Permanent, Positive' disappears a little behind 'Beast Reinforcements'. I'm playing on 1920x1080. - When you have only Food or Hope, but not both, they still both show up red when you click on a new location to go to. Would look nicer if the one you still have some of would have the normal color. - The 'Infect' Leader card doesn't work? Can't seem to use it on any unit. 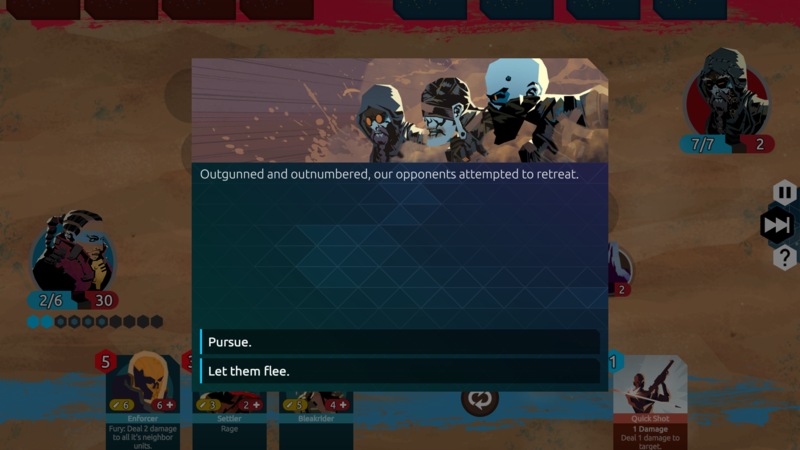 - It seems like when you get a human enemy to surrender it's always the best option to execute them, since it will give you loot from their corpses and loot from winning the match, making the other options a bit useless when an attempt to recruit them can fail (only tried recruiting once). 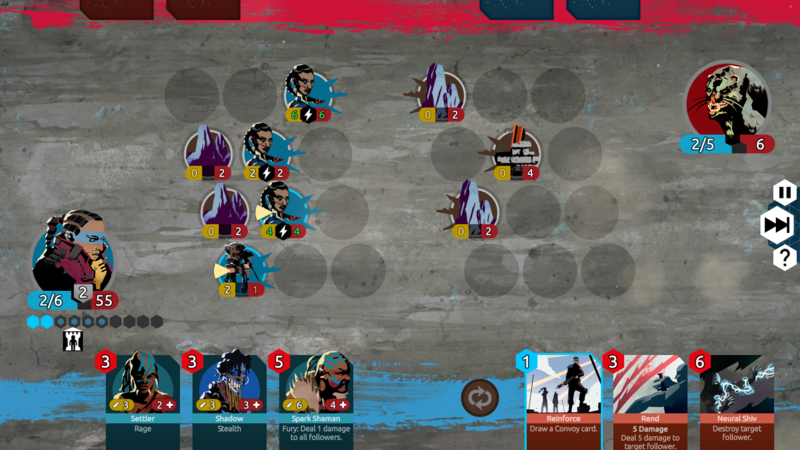 - The way the game works atm, with opponents retreating fairly quick, there's no use for high-momentum cards. I had the Avatar card in my deck, but never got to a point to use it. These are my notes after 2 full playthroughs. As said, the game is brilliant! Every scene is worthy of hanging on my wall as a print (giving a hint here that I'd love to be able to buy a print at one point :D). We're talking about the button at the right side of the screen, correct? Are you saying the button should not be visible or are you saying that the button is visible and clickable, even though there's nothing to do? Shouldn't you be able to attack Obstacles with Leader cards? You should. You couldn't? I'll have to check if I somehow broke this but you should be able to use attack cards to target obstacles on either side of the field. Seen several typos in my playthroughs, don't know if you want me to keep track of them or if you get to going through all the text at a later time anyway? It's after you've pressed the button the first time. You get to the actual screen where you can click to give 10 Food to gain new followers. But after you've done that it feels like it should say either something like 'There're no more people for you to recruit', or just have you go back to the camp screen, because atm it shows the same text as you get with the first time you recruit but you can't click the button anymore. Can't check it now since I'm at work but it wasn't possible for me to attack Obstacles other then with my Followers. Had to waste a few attack turns for some loot. When using "Heal Wounds" to heal your followers, how many wounds does it actually heal? I thought at first that it healed 1 wound on every follower. But later on, when I had an insane amount of followers, I noticed that this is definitely not the case. I did 3 heals, and barely any of my followers got healed. If it healed all of them of 1 wound each time, all of them would have been cured. Flying units can't fly over their allied units, only over enemy units? Seems a bit strange to me. Heal wounds heals a total of 10 wounds on your followers. It tries to heal 1 wound on each follower, starting with the most heavily wounded ones. As for flying. It's sort of intended to be sniper from the other side. Sniper: Can attack even if attacker is behind obstacle. Flying: Can attack even if target is behind obstacle. You're right in that it doesn't make a lot of thematic sense but it felt like that way the abilities best complement each other. Does flying go around taunt? That would also make thematic sense. Thank you all for the feedback. I'm taking notes and will post a detailed "what's next" update tomorrow. 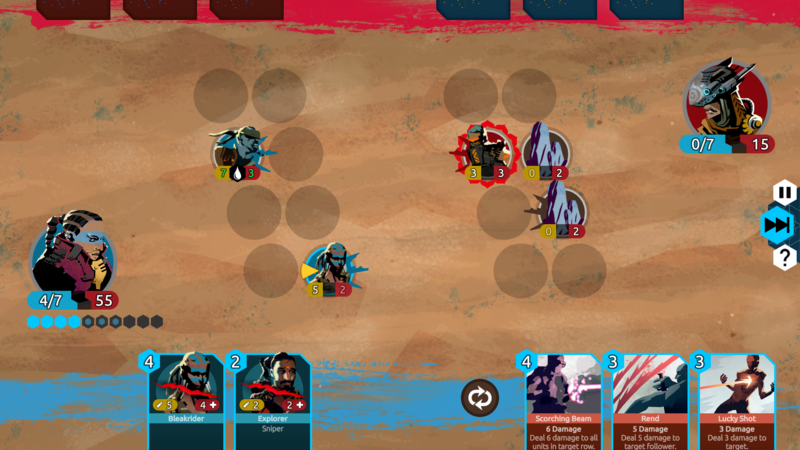 In a few conversations in various places, the concept of card combinations as a threshold for the power or "permission" for the AI to do certain things has come up as part of the game design. My impression of the AI strategy and behavior, and what I've taken in from various conversations, leads me to suggest that it may be wise to thicken up the AI decks and introduce routines for sub-optimal play. What I think may be happening is the enemy player is recycling anything too expensive to play, playing everything they can play as fast as they can play it, which is usually direct damage and reinforcement cards, and building up very effective combos as a certainty and deploying them as soon as it is a valid choice. The highly overlooked but very special game AI War is considered to contain an "Emergent AI." A 4x type space strategy game in which the enemy group is much more powerful than the player, but what makes it Emergent is that the way the AI chooses and develops strategies. Reportedly, even so many years after it came out it still produces stratagems the developers never intended or programmed into it. From what I understand, this is accomplished by having the Enemy use only observed information about the player and their activities, determine what a perfect strategy would be against the observed model, and then regress the perfect strategy to be less than perfect, ie, imperfect strategies, openings, etc. I think they also include a level of commitment to fighting the player based on how annoying the player is to the AI's goals, which determines what the fight model looks like. All that being mostly academic, relevance to Nowhere Prophet would be mixing up the optimal builds and play styles of the enemy decks, so that I don't know exactly what I'm up against. Beasts have been a focus of my attention for balance suggestions, for a few reasons. We talked about game balance at the beginning of the game, and making the beginning of the game accessible. The first milestone might therefore be the milestone at which the player feels they have a grasp of the game and are ready for tougher encounters. Beasts are also a target the player seeks out for their food rich payout. If I have no food, and I can choose between beats and *literally anything else* I choose beasts. Things beasts aren't doing at the moment, as far as I've seen, that they could be doing, are things like stealth, and one turn flight. A sneaky panther-esque animal, or a chameleon skin type thing. If winged creatures aren't appropriate for the beast deck or are planned for an insect swarm deck, then an "on incite gain flight for one turn" or "fury: gain flight for one turn" or a Leader card that gives flight for one turn would represent a savage bestial leap, allowing the horde to pounce over barriers. Tying in what I was saying about AI War and Emergent AI relies on how the AI determines what it does next. I've only caught a few glimpses behind what might be the curtain, so I really can't speak to what you guys are using. The AI seems to make some good decisions, and some bad decisions. Playing to the field much of the time is good at the moment, as it allows for more playtesting of the way cards work. I've seen the AI use a field full of chargers to move them around or smash up obstacles instead of attacking me or my followers. I've seen the AI provide a buff to a creature that just finished attacking me. I've seen the AI place a creature in front of another creature that just refreshed. So some of this logic appears to be random. Giving the AI a clear understanding of grand strategy for a game like this is super challenging, particularly if you want it to be able to anticipate player moves or provide an interesting opponent. I'm certain you guys have a system already in place, and I haven't identified precisely what it is just yet. Giving the AI patterns of behavior based on what it has or what the player has done, such as "mitigate available attacker with if available attacker if then available direct damage card loop or place taunt defender exit." But the game is deeper than the current turn, which is why it is attractive. All the parts of its complexity that make it an enjoyable game to play, of course, make it challenging to develop AI for. This post is getting super long, so I'm gonna end here and pick up this concept elswhere. AI is hard. Really, really hard. And Nowhere Prophet has a system in place I'm pretty happy with. It's not perfect and it needs some tweaks but there's not going to be a major AI rework - simply for lack of time. I'm not an AI expert and building a really really good system (see Eternal for example) is hard. So unless you find someone who's good at this exact problem and willing to put the time in to make a new AI (for free, cause there's not really much in the way of budget either) then I'm willing to look at it. Yes, I agree, on both points. AI is hard, and your time is most likely better spent on working on the content. I can't imagine setting out to do a project and thinking "I'm aware of three ways to do AI. I'm going to use one that isn't as good as another, but is just as deployable." AI is a huge, nebulous, confusing, omni-faceted space hydra can be as different a problem as the people trying to solve it. My micro-studio, Applied Game Science Laboratories, is based partly on trying to address age old problems like AI and machine learning in new ways and applying concepts from other disciplines to them. My background is in molecular biology and medicine, so the way I attack a problem like this is probably different than the way a classically trained programmer might. I don't know really, since I'm not a classically trained programmer. I could see it being possible to deploy some relatively small scale solutions to certain types of AI problems for a game like this using some of the principles I've been working on. It largely depends on what you've got under the hood and which tools you're already working with. At the end of the day, it sounds like you're happy with the current performance of the AI overall, so I'll move my feedback on to more focused areas of content rather than broad issues. If you want we can chat about the topic sometime over on the Discord. And don't worry about the long posts - I'm always glad to get feedback. At the bottom of screen where it shows the followers, make critically wounded followers (3 wounds) stand out more. Right now there are 3 shades of red. This looks nice, but it is very hard to tell the difference between the shading. Like when you have some followers with 1 wound and one follower with 2 wounds, I go and see if that follower has 3 wounds. When you don't have all 3 shadings showing up, its sometimes hard to know which ones are there. Mostly I want to just easily see if there is a critically wounded one, so I know to swap them out. (Also: LOVING this game so far - artwork is beautiful, combat is fun/smooth, story aspects are awesome, cards are awesome). When you are in the deckbuilder and hovering over waiting for them to appear, they appear directly over the cards in your current deck. Moving these hovers to the left would be beneficial in looking at cards easier. Also clicking these cards doesn't do anything. Its not exactly clear how to add/remove cards from your deck at first. Maybe clicking a card in the right hand column to remove would make this easier for the user. And clicking cards in your library would add them to your deck would speed this up. I think the difficulty level of the game is pretty tough as of now. I know its a rougelike and its supposed to be challenging but i think the AI difficulty level scales up considerably once you get to the second map and becomes REALLY hard. I've played this game about 8 times and have only finished till the end of the early access campaign twice. 60% on losses due to resources, 40% due to battle. This is my least favorite part of the game as of now and overall i think needs to be more balanced. Losing this way after getting some great cards is really tough. Not being able to reload at the beginning of your existing map and having to start from the beginning feels bad. If you're working towards a good deck, this can be erased by resources depleting because you're fighting too much or taking the long way to the end. Might be cool if their was an alternate mode or something? Like casual mode and rougelike mode? Thoughts. Sometimes when starting a few of the first points on the map the "enter combat mode" screen freezes which forces the player to exit to the menu manually. When trying to load from this position, the save state is corrupted, not allowing you to pick up where you left off. If you had a good start, this can be a bummer. Probably a bug but i figured was worth mentioning. Otherwise, after the first couple of points of the map are reached, this doesn't happen at all and saving works fine. Not sure if this is on the roadmap but i feel like this game would play great on tablets and smartphones. Honestly, this would be my favorite phone game were it available for me to play on the train every day. Overall I'm really LOVING the game though. I never leave feedback like this for games in dev but i can see myself playing this game a lot upon its final release. Really excited to see the final product and evolution of the game! I actually thought about that too. 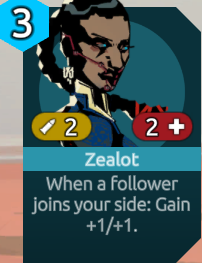 I started redoing the tooltip for followers on the board so you can see the actual card, and did some research on other card games and experimented a bit, and turns out it is a lot more useful if the card does not cover the cursor area but rather appears to the side. So I added that and voila - massive improvement. I'm probably going to straight up add that to all the card tooltips. Yeah. I've noticed this isn't ideal. It's something I can clearly see whenever someone is streaming the game. I'll have to see what I can do to improve this. As Inxie mentioned - this is really player dependent. I think the game needs a better difficulty curve in general - easier in the beginning and a good ramp up. At the moment the enemies just aren't balanced as well as I'd like. And the resources are another thing. I want the game to be hard, so there will always be a degree of randomness to your food stores but the general economy needs some work.. There is also the idea - which is on the "nice to have" list - to add a selectable difficulty. That would probably influence enemy strength and resource gain to be somewhat acceptable to balance. I really need to look at this. The key issue with bugs like that is reproducing them. As soon as I can create it on my machine I can look at what's broken. Alternatively a log file is always helpful, so if you run into the issue again, please do report a bug with the log file. Note that you'll have to do that immediately after closing the game. Opening it again will overwrite the log file. The quick answer: Tablets are very very likely but will take a while. Phones are not going to happen unless this thing blows up so massively that it's worth to invest the time and energy to completely redo the interface to work on a smaller screen. 1.Would also love to play this on android. 2.At first I thought the difficulty was a bit harsh due to lack of food. However, once I figured out that killing beast enemies drops a considerable amount of food I was fine. I feel like currently the balance of food is just right in that it evokes that desperate sense of needing to survive early on and also makes having an ample supply that much more satisfying once you get there. For those that struggle with food. 1. Try to take low cost routes early. 2. Take every battle you can early. If you run into a beast-type enemy try to defeat them instead of letting them flee whenever possible. Completely defeating them results in a large drop of food. 3. Get to a store as soon as possible and spend all of your batteries on food. Once you are over ~70 food things should be smooth sailing from there. Usually if you can do 2 of the above 3 things you should be set early game. Interesting. I think this game is easy right now. I've played the first 2 levels a ton of times, and maps 3+4 a ton of times, and I have yet to die or lose a battle. I don't even have to heal, and I finish the game fine. Its good that the dev gets feedback like yours, if the dev only gets feedback from people like me, then he'd probably be tempted to ramp up the difficulty a lot. I've never had this happen. Sounds like its specific to your system. Maybe send him a bug report, with some game logs? Hey everyone, just bought the game and played for a few minutes. A couple of things I wanted to note. I soft-locked on the first combat I attempted. I believe the music change, but I didn't go to the combat screen. I quit out to the main menu, resulting in a corrupted save. After starting a new game, everything was fine. Although he doesn't show this in the video, I suspect this is the same thing that happened to Splattercat, because when he started a new game it picked up in the exact same spot. I'd like an option to decrease the time required to hover over a card before the large version pops up. It feels very slow right now. This MAY be because I am playing on an old Mac mini / potato, but everything else feels so smooth, I don't think that's the case. Just an initial impression thing that I'm sure I'd get used to, but my brain kept trying to tell me red was damage, not health. Consider a change to green? Looking forward to diving deeper. Yeah, that should not happen. I noticed the same when watching Splattercat's video. His tutorial was slightly out of whack because he had some crash he mentioned briefly. I will have to double and triple check this. Crashes shouldn't happen, especially not this early in the game. It is currently set to 0.75 seconds but will be reduced to 0.5 seconds in the next major update. I am also considering shifting the display of the card away from the pointer. There really is no way to do this "right". I had it as red = attack, green = health but people kept complaining. In the end I looked at Hearthstone, considered them the market leader and just took colors that were similar to theirs. Still I decided to add icons to the cards themselves to make it clearer. It seems that the yellow/red color scheme works for a lot more people than red/green ever did. Plus it has the added benefit of still working for red/green color blind people. And lastly: Thanks for your feedback! I hope you enjoy the game. If you have any questions or need anything else, please let me know! if that's the way Hearthstone does it, makes sense to follow their lead (I played briefly ages ago). As I said, not a big deal and I'm sure I will adjust to it, it was just one of those immediate impression things, which are occasionally useful. On the soft lock, yeah I tried to provide a little more info, in case it was the same thing he encountered, since he didn't show it. Also, I doubt he was on the Mac version, as I was. Hopefully that helps track it down. Oh, I should mention, I believe the option I chose on that encounter was to take out the leaders. I can't verify, since I can't get back to that encounter. There was a bit of text after about that leading to a fight, and then it stalled. Yes, first impression feedback is really valuable. It's not something you get often. Also regarding the crash: from the sound of it it's something that happens when the combat wants to start but for some reason it doesn't. A log file would be helpful but that's reset every time you relaunch the game so don't worry about it. Should you run into another issue though it'd be very helpful. I'll just have to sit down and try the start a bunch of times to see if I can trigger the crash. As soon as I can reproduce it I can usually fix it. If I can't it's really hard to pin down what caused it in the first place. 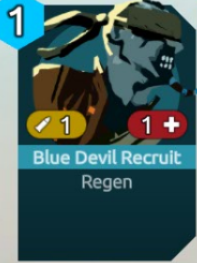 I'd rather the tooltip never showed up when you are hovering above a card, I would much rather use the right mouse button to bring up the tooltip / big version. Really I basically never want the bigger version. I already know what the cards and abilities do, and I can read them all fine on the smaller version. Its easier to select and deselect cards when a tooltip isn't in the way. I could get behind that. I was playing in a 1/4 window on a 1440p monitor, and even at that size, everything was easy to read (that surprised me, actually). I didn't really need the larger size, but the long delay (which is already being changed) made the interface feel laggy. But I'd be perfectly happy with an alternative like you are suggesting. Yeah, it's funny how much a tiny thing like a tooltip can actually affect the experience. I feel like a retreat mechanic for the PC is sorely lacking. Sometimes after pressing the assault against the AI, I get locked into a battle of attrition. I feel like being able to cut your losses and retreat for some sort of penalty would be a good option to have. Is there a reason you cannot use consumables from the map screen? I understand needing a good camp site to heal but it seems like you should be able to use luxury goods whenever you are not in battle, not just at special camp sites. A small one (not sure if it has been mentioned before) but I wish there was a way of seeing the refund price of a piece of equipment before selling it. Would make sense if this was only available when selling them though. yeah, that one's on the list for the next update!